How is a Manhattan clam chowder different from a regular chowder? A clam chowder recipe is usually made with creamy and has that lovely white creamy look and taste. The Manhattan version is made without cream, using tomatoes to flavor the broth. Both are amazingly good. See which you prefer. If using fresh clams, wash them in 3 cups water then drain them through a cheesecloth. Reserve the liquid. Cut the hard part of the clams from the soft part. Finely chop the hard part of the clams, the salt pork and onion. If using canned clams, strain the juice. Add water to make 3 cups of liquid. Use this liquid in place of the water measurement given above. Sauté the salt pork very slowly. Remove and reserve the scraps. Add the minced onions and hard part of the clams to the pan, leaving the pork fat in the pan. Stir and cook slowly for 5 minutes. Sift the flour over them and stir until blended. Heat and stir in the reserved liquid. Add the potatoes, tomatoes, green pepper, bay leaf and catsup. Cover the pan and simmer the chowder until the potatoes are done, but still firm. Add the pork scraps, the soft part of the clams and the butter. Simmer for 3 minutes and season to taste with salt and pepper. Serve with oyster crackers or saltines. Makes 8 cups. If you like this recipe, please take a moment to to Pin it to Pinterest, Tweet about it, Like it on Facebook and leave a comment and your favorite soup or seafood recipes below. 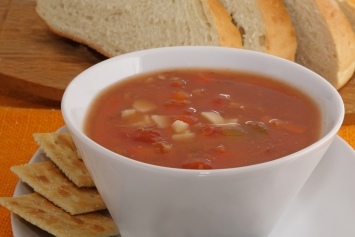 If this Manhattan clam chowder makes your mouth water, you may also want to have a look at our recipe for creamy clam chowder that you will find here.